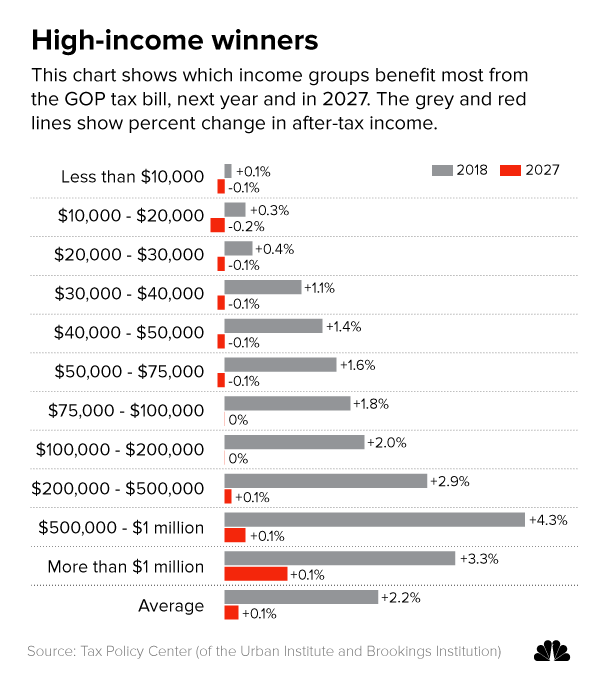 The new tax law will change net income for about 85% of the population, but filing won’t be simplified the way Republican lawmakers originally promised. Suffice it to say that this is one tax year when it will be in your best interest to seek help from an accountant rather than try to do your own taxes. To see exactly how the Tax and Jobs Act will affect your own taxes, check out this online calculator created by the Tax Policy Center of the Brookings Institute. About 20% of households will not receive any tax cuts under the new law. And a quarter of these filers will actually have to pay more in 2018. Yet this is a stark contrast to the bigger tax cuts that the wealthy get, and the even fatter ones that corporations will enjoy, a 40% reduction that takes the rate down to 21% from 35%. Unfortunately, most sole proprietors and the self employed aren’t included in this and in many cases might have to pay more taxes due to a 20% cap on the amount of expenses that can be deducted. Among households, the biggest percentage tax cut is going to those making $308,000 to $733,000 annually. Households making even more than that would enjoy an average tax cut of roughly $50,000 or 3.4% of their after-tax income. And those in the top 0.1%, who will make $3.4 million or more next year, would get an average tax cut of about $190,000, or 2.7% of their after-tax income. Most of the tax cuts expire after 2025, and by 2027, all but the top 1% of earners would return to paying the same taxes they did before the law changed — at that point average tax cut would fall to about $160. Making the cuts temporary is expected to help minimize the effect the law will have on the federal deficit — and that in turn can send up interest rates, which should slow down borrowing. That might be a blessing in disguise, however, since Americans’ indebtedness has reached record levels. It’s also possible that these tax measures will expire much sooner than 2025 — possibly even by 2019 if voter sentiment continues to lean more heavily toward Democrats. If the party retakes control of Congress in the 2018 elections, steps would be taken to repeal the Tax and Jobs Act even faster than it was enacted. That said, you might find further insights into the legislation by watching the videos below — one showing each political party, followed by a clips suggesting strategies for using a tax-cut related bonus. After you watch the footage, please let us know your opinions in the comments section beneath this post: What are your biggest worries about this new law?